From our inception, Don Lahey has been the most instrumental person in the creation and implementation of our current wine selection process. He does an exceptional job for us and we're very proud that he's a part of our team. There are many factors that contribute to why he is so good at what he does; the single most significant, however, is his pure and intense passion for wine itself. Read on and find out more about just how passionate Don is about his work and why you're going to be thrilled with the wines featured in The International Wine of the Month Club! Don Lahey's career in wine began long before his first job in the wine industry. 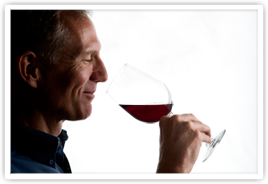 "I liked wine the very first time I tried it as a small child," he recounts. "My parents were absolutely amazed, and so was the rest of the family, especially when I began fiddling with the cork and trying to make head or tail out of the Italian on the label. Even the bottle intrigued me. An eight-year-old prodigy taster I was not, but I sure did like wine," he recalls. Nevertheless, the seeds had been planted, and like good vines in the right soil the roots would run deep. When Don was in high school, he developed "stomach trouble," for which a small amount of wine with dinner was prescribed. Why didn't we think of that!? "I was the only kid that I knew of in high school who was encouraged to take a drink," Don recalls with a smile. "That was no hardship, since I liked wine. Soon after beginning the nightly ritual of wine with dinner, I found myself asking my parents if I could try a variety of wines, instead of the one or two household perennial favorites. My mother, always solicitous of her youngest child and an avid wine drinker herself, convinced my father, a teetotaler at the time, of the merits of quality and variety. Hence, my tasting career began." And we can assure you it didn't end there. By age sixteen, Don admits to the privilege of having tasted quite a few classified red Bordeaux wines. In fact, he says he will never forget his sixteenth birthday. "My father allowed me to choose the wine at dinner, a lucky guess ultimately on my part and a fatal financial mistake on his," Don remembers. "I can still recall the absolute wonder and pure splendor attached to that evening. I also learned just how great the wines of the Margaux appellation could be. Some would have called the experience an epiphany. My father probably referred to it as theft or at the very least white collar crime, but he never said a word to me or ever mentioned the cost of the wine, nor did I have any inkling at the time just how much that marvelous bottle cost, but it was quite a long time before he would again ask me to choose a bottle of wine. This was certainly my first lesson in the ultimate pleasure of great wine, but indirectly this experience also laid the groundwork for a valuable lesson in understanding the inherent need for value when selecting wine." While in college, Don continued to taste fine wine, but nothing quite so glorious as Chateau Margaux. In the summer of 1975, it became increasingly obvious to him that steady employment was a necessity he could no longer do without; his budding interest in wine was becoming increasingly expensive, so he took a job as a busboy in a New York restaurant, the only summer job he claims he could find. Little did he know then how valuable an experience that summer job would be, and, that it would ultimately begin his career in wine. "Since it was a very fine restaurant, I learned how to cook as well as how to serve." Everything was French tableside service. The restaurant also provided many opportunities for tasting fine wine and even sent Don to school for wine tasting classes. "I thought I had died and gone to heaven,” he recalls. Needless to say, one summer was not enough. Don worked at the restaurant in several capacities for three consecutive summers and for nearly a year after receiving his degree from the University of North Carolina. In the fall of 1976, Don went to live and study in France, where like so many Americans he fell in love with that country's great wines and vineyards as well as the joys and intricacies of Gallic cuisine. He visited scores of vineyards and cellars and tasted a wide variety of regional wines. Upon returning to the United States, Don found employment in a boutique wine shop, where he honed his palate. By age twenty-three, he was the fine wine buyer for this upscale establishment. "From the moment I stepped into that shop, I felt at home," Don fondly recalls. "It was then that I realized just how passionate I was about wine, and that there would be no turning back. I would have to spend my life around fine wine." Shortly after beginning his retail career, Don began writing a wine column entitled "The Grape Vine" for a suburban New York newspaper. After only a half dozen articles, "The Grape Vine" was syndicated. Meanwhile, Don started teaching wine classes at Five Town's College in New York and began wine consulting for a number of New York restaurants. He also teamed up with Michael DeCillis, a childhood friend and fellow taster, and they began making their own wine. "Michael was the oenologist in this venture," Don explains. "If it were not for Michael, I would never have learned about the technical side of wine. Michael also helped me develop the wine rating sheet that I still use today. In fact, our tasting panels all use this implement to assist us in evaluating the thousands of wines we taste." In 1983 several colleagues enticed Don to leave his lucrative consulting business and begin a wine importing company and distributorship in New York. That same year Atlantic Imports was born and Don was named Director of Imports, a position that required him to travel extensively, taste, and purchase wine. Atlantic Imports' specialty quickly became the importation of fine wine from boutique estates from around the world. During the next seven years, Don worked extensively in Burgundy, California, Champagne, and Chianti. And, in addition to developing an elite array of fine European wines, Atlantic Imports also became one of the nation's leading purveyors of Australian wines. Twenty years ago Australian wines were a rarity in the United States, in spite of their inherent quality and great value. Don and his partners did their fair share to change that scenario because as Don is fond of saying "you just can't drink a label or a price tag; good wines come from a myriad of unexpected places." While Director of Imports, Don also served as a judge for the prestigious American Wine Competition, which was then sponsored by Marvin Shanken, the publisher of Wine Spectator. By 1990, Don had divested himself financially in the importation and distribution of wines and took a leave of absence from Atlantic Imports to pursue full-time teaching and writing. He organized weekly wine seminars and began teaching wine classes at the University of North Carolina at Greensboro. Since that time he has worked on various wine ventures with dozens of private and publicly held corporations and hundreds of individual clients and collectors. Salute, Don! Keep up the outstanding effort!